DA NANG, VIETNAM, Feb 2, 2018 - (Media OutReach) - DHL Supply Chain, the world's leading contract logistics provider, has been appointed by Bridgestone to manage its warehouse operations in Da Nang. Bridgestone will entrust warehouse facilities and management, plus outbound transport management, to the world's premier logistics provider. DHL will utilize its own fleet and sub-contracted vehicles to deliver to Bridgestone's distributors in Vietnam's central provinces. 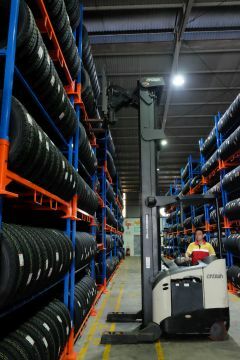 The new Bridgestone warehouse in Da Nang, a rapidly expanding regional distribution hub, spans 3,000 sq m.
To deliver Bridgestone's specially designed bespoke racking (stillages), DHL devised a flexible, efficient solution of tire storage to minimize damage and promote cost-efficient and timely transport to the central provinces. The stillages fit Bridgestone's TBR (truck, bus and industrial/commercial tires) and PSR (passenger car radial) tire ranges, and the warehouse can store 20,000 tires. DHL Supply Chain provides cost-efficient, high-quality and innovative solutions for customers across all sectors. It plans to grow its footprint in Vietnam to build new facilities, expand truck fleets and invest in new technology, creating additional jobs. The company believes that end-to-end supply chain solutions and service innovation will support cross-sector growth and better serve customers in Vietnam. Kevin Burrell, CEO, DHL Supply Chain, Thailand, Vietnam, Cambodia and Myanmar, said: "DHL is able to differentiate from the competition by offering customized storage and distribution solutions, with technological and innovation investments focused on delivering exceptional client trust. We are proud to support Bridgestone, the long-admired global leader in tire technology, as both companies continue to grow operations in Vietnam. We are beginning to intensify our investments in warehouse and transport expansion in Thailand and Vietnam and will further expand over next three years. This new focus, coupled with our ability to deliver integrated solutions for customers, enables us to enhance value and stand out as the market leader. We are committed to help businesses operating in Vietnam to succeed, as the market continues to develop to meet its full potential."